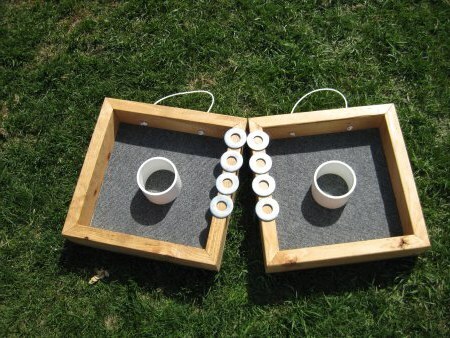 The washer toss game is a game that can be enjoyed by young and old. Many events like cookouts are an event wherein you can enjoy this kind of game. In the market it can cost you a lot if you will buy boards so to enjoy this kind of game and at the same time save, it is advisable to know how to make your own washer toss game. 2 pcs. plywood with a measurement of 3 ft by 8 in. Be sure that you have already prepared all the materials you will need to pursue the project. This can be an easy project in which is also a good way to spend time with other members while making the project. Put the 3 ft. of wood side by side with each at the end part of each wood. When you use two short wood with 8 inches long and make a frame rectangular. Use the drill device that can be attached with the wood and be bound together. Attach it together using screws in each corner. Make 3 more holes in the plywood, then at the center, and the most top portion make a hole and it should be 6 inches under top of the wood. Mark all the holes you will make and then you can already drill the plywood. You should put the plywood at the top frame with the use of nails and screws in every 3 to 4 inches that is along the frame. Use the carpet and attach it on the plywood. You can choose to have this procedure or not but if you can notice it can be more presentable. This is a good material to be place in your toss game board. Use a cutter or a knife so that you can carve holes in the carpet that at top of the wood. Be sure that screws are attached properly so that you will not damage your water toss game again. Do not forget to properly paint and have the best plan you can have in your projects.